Everyone do your happy Friday dance! First things first. Since it’s Friday that means it’s time to check in on the very last week of the June Yoga Challenge hosted by the beautiful and talented Courtney at SweetToothSweetLife. I am happy to report that I once again have met my goal of three yoga sessions a week. Yoga On Demand has been great–I have been able to practice yoga in the comfort of my own living room at any hour of the day. I began the challenge one week late into June, but I can honestly say that in the three weeks that I have been partaking in the yoga, I have improved my flexibility and have learned how to incorporate breathing techniques throughout my day if I begin to feel stressed. I also feel like my arms are beginning to tone up a bit from all of the planks and downward dogs. 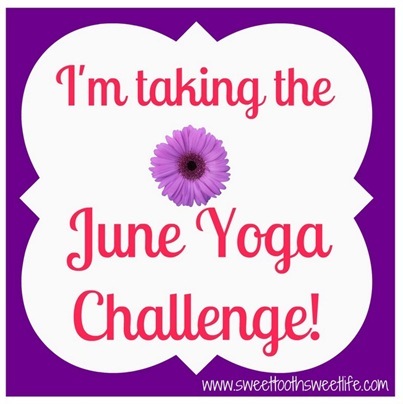 Although the official June Yoga Challenge is over, I will absolutely continue to practice yoga, and hopefully move from a beginner status, to a more intermediate yogi. Hopefully someday I will be able to master the crow pose! Thank you, Courtney for such a great opportunity and for inspiring me to get my yoga on. 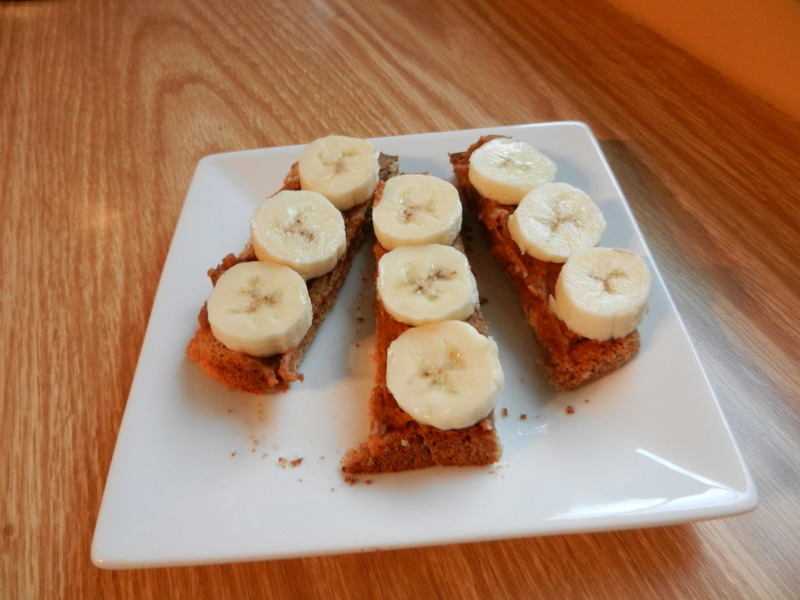 A piece of spelt bread toast with cinnamon honey PB2 and banana slices. 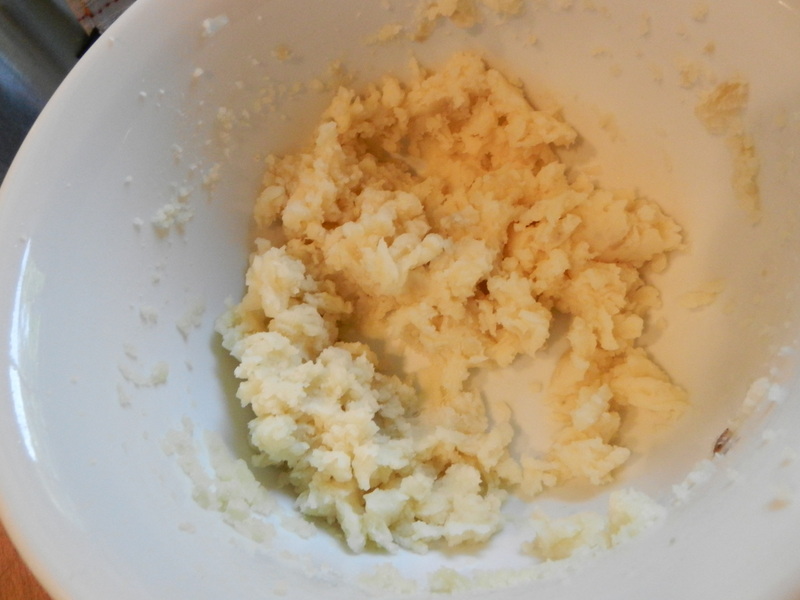 And whipped the potato with a small amount of chicken broth. 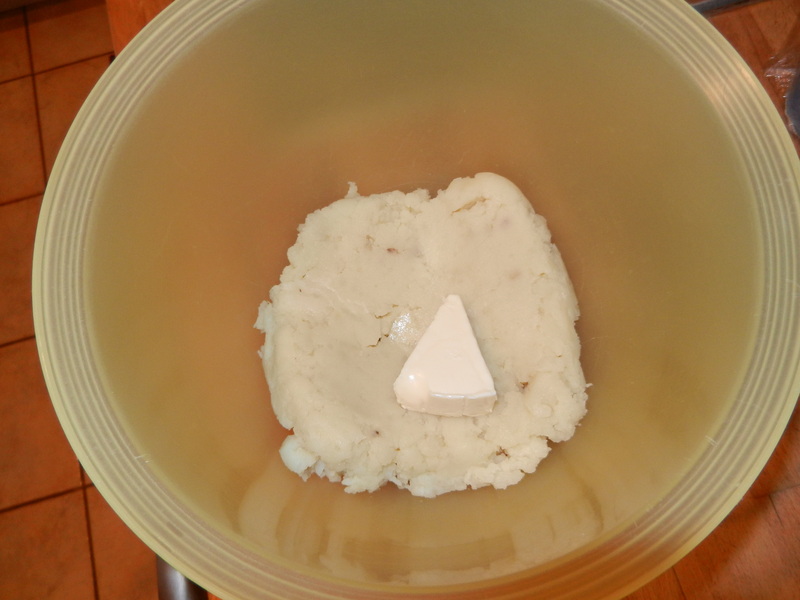 I then mixed in one light swiss laughing cow wedge, and added salt and pepper to taste. I packed it up in a nice little tupperware container and brought it with me to work, warmed it in the microwave, and had a quick and nummy lunch. There is nothing to it really. 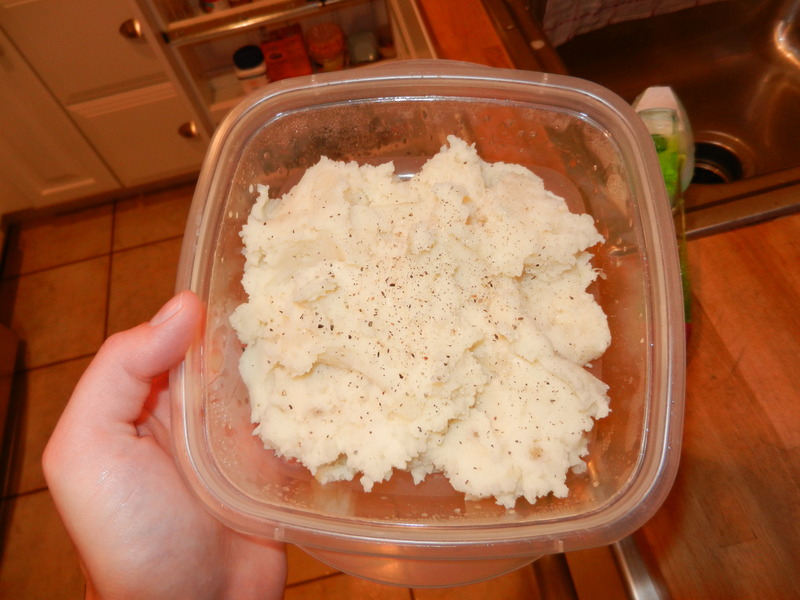 Homemade mashed potatoes are well worth the small effort. I really enjoyed adding the Laughing Cow wedge into the potatoes. 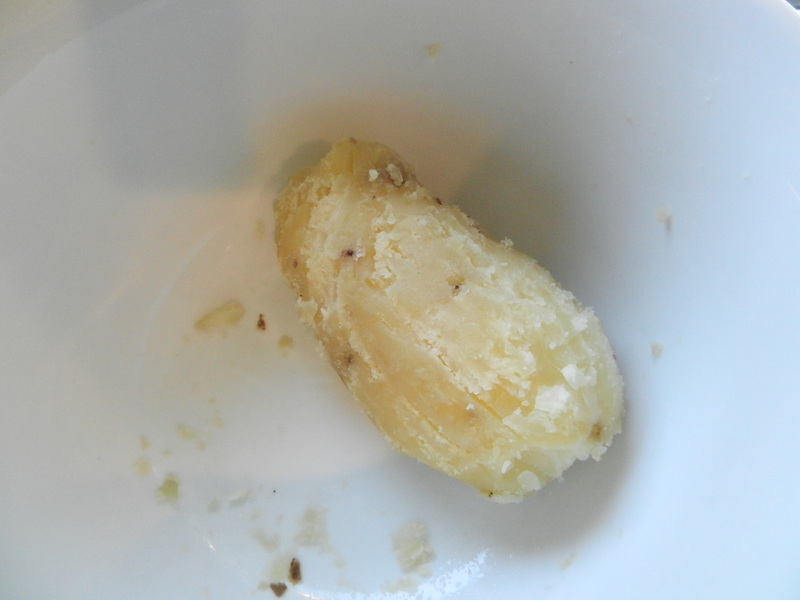 It gave a very subtle creamy cheesy taste to the potato. 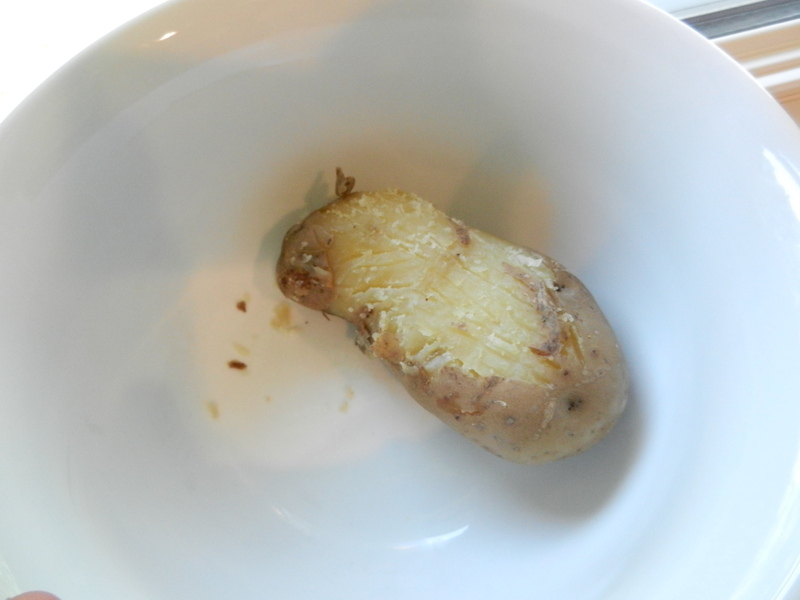 If you don’t want to use the crock pot method for cooking your potato, you can always bake your potato in the oven, or for an even speedier cooking method, poke holes in your clean potato, and cook in the microwave for about 5 minutes, turning halfway through (cooking time varies depending on the size of your potato). I also had some super juicy watermelon with lunch. Your eyes aren’t fooling you. 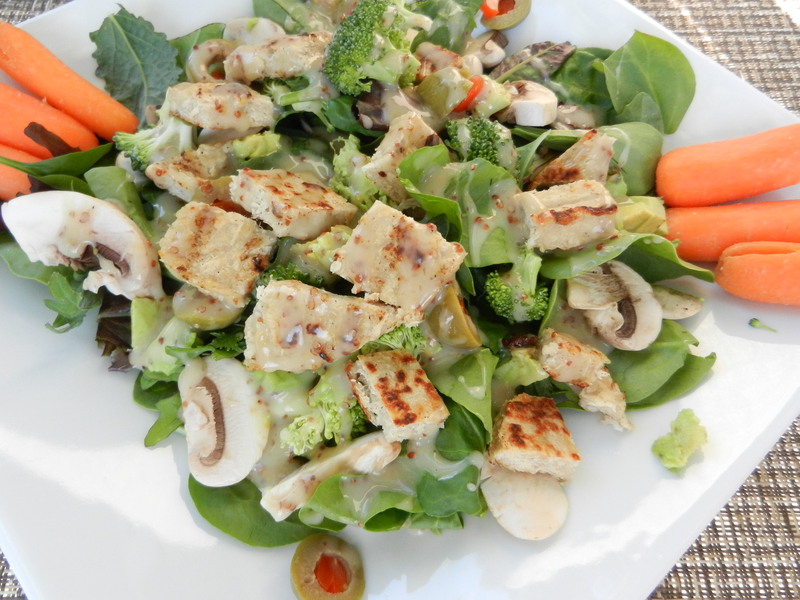 This is a veggie-packed salad. I am taking a different approach to my colitis and only time will tell how my body reacts. 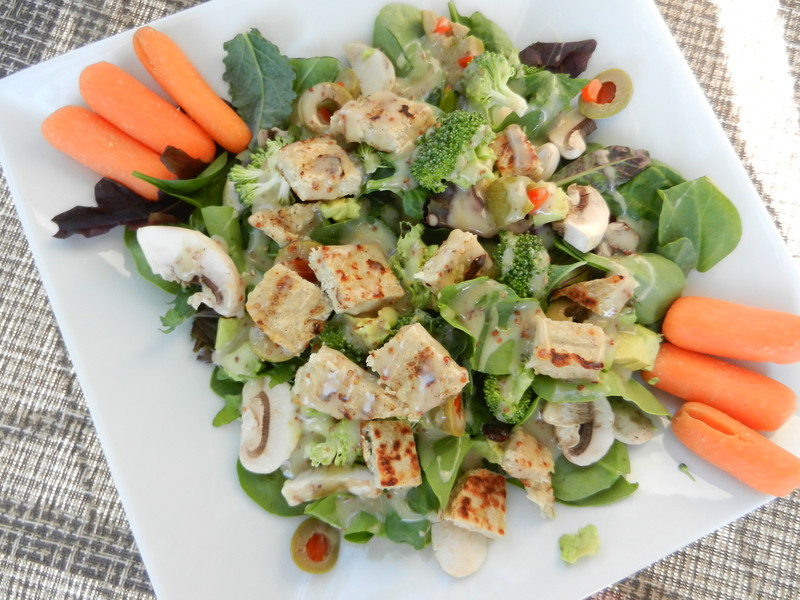 This dish is full of mixed greens (kale, spinach, and other dark greens), broccoli tops, mushrooms, avocado, olives, carrots, Morningstar’s Griller Chik’n Burger, and Newman’s Own Lite Honey Mustard. Welcome back greenery. You are lovely and I have missed you so. This was my first time eating Morningstars Griller’s Chik’n which is a vegetarian chicken burger. Each burger is 80 calories, 3 grams of fat, 350 mg sodium, and packs 9 grams of protein. I prepared the burgers by placing them in a sauté pan on the stove top, and cooking on each side so that both sides crisp up and the burger is heated through. The taste of this burger was great! I think they tasted like real grilled chicken. It is a nice substitute to meat every once and a while. I love Morningstar veggie products. They do a great job. Last night I started reading the book, “Breaking the Vicious Cycle” by Elaine Gottschall. It is all about treating intestinal problems including Ulcerative Colitis, through the diet. The book focuses on scientific research which proves that individuals with intestinal distress can often benefit from a specific carbohydrate diet. 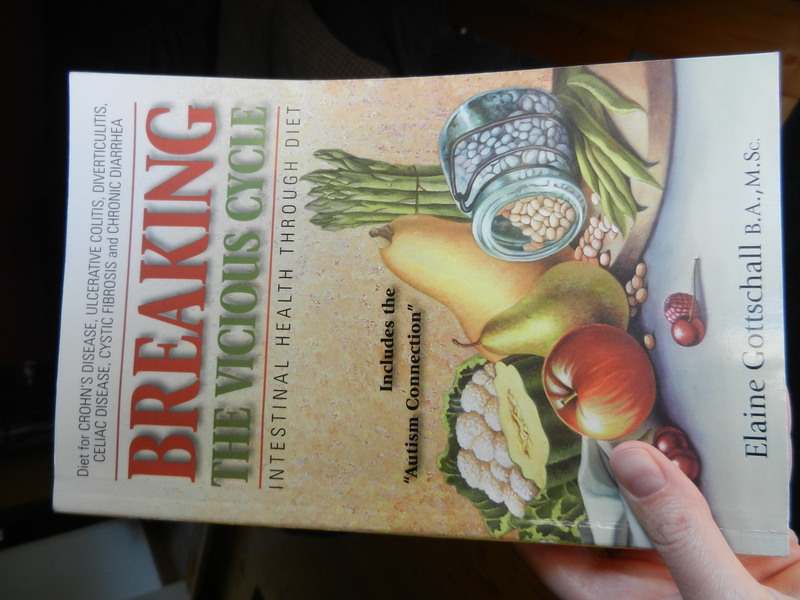 I am only about 20 pages in but I am very curious about this diet and am anxious to read more. I’ll keep you posted on what I find and tell you more about the book later. I took a rest day yesterday on the workout scene. I will probably take another one today. Tomorrow is the Warrior Dash! 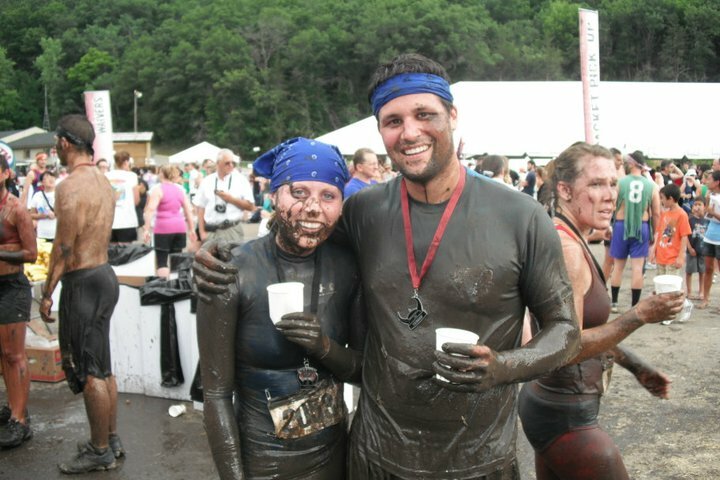 For those of you unfamiliar with the Warrior Dash, it is a 5k run combined with obstacles throughout. 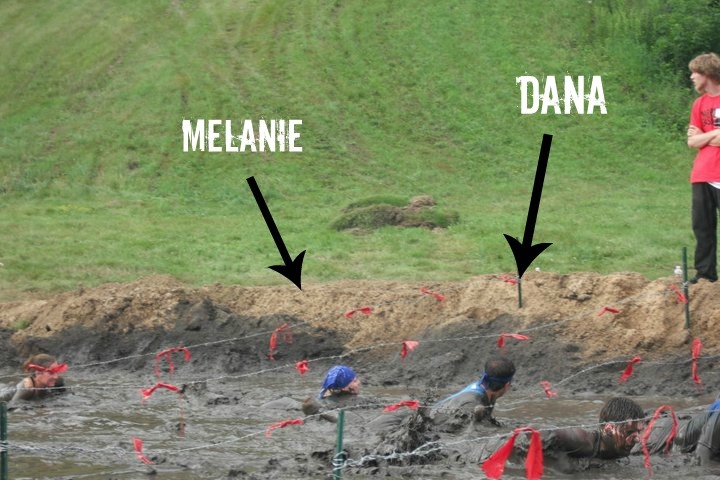 The very end of the race involves crawling through 2 feet of mud. It’s a beautiful site. I’m excited to fill you all in on the details later. Happy Friday! Have a great day. Hello there! No monkey business I have lots to share as always. Yesterday we had a potluck lunch at work. 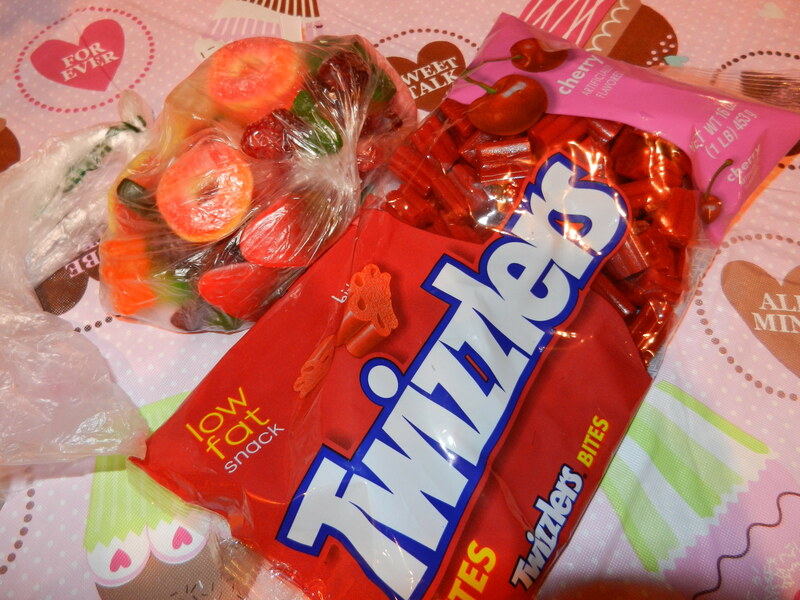 It was Valentine’s themed so everyone was supposed to bring food that was red, pink, or purple. My food-minded brain started thinking of tons of different options: pink quinoa with Craisins, nuts, and apples, cupcakes with pink frosting, apple nachos….had a hard time deciding on one. 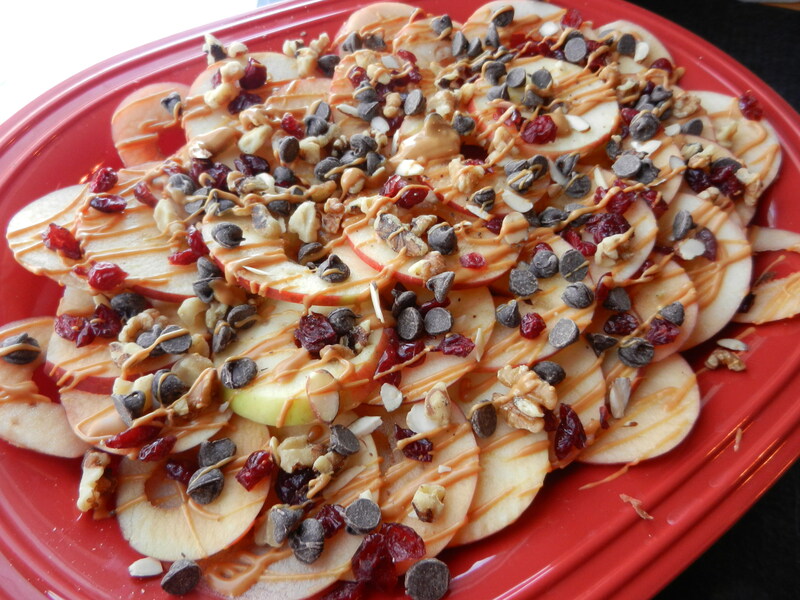 But I did decide to go with the Apple Nachos. I got the idea from Pinterest but changed it up a bit. 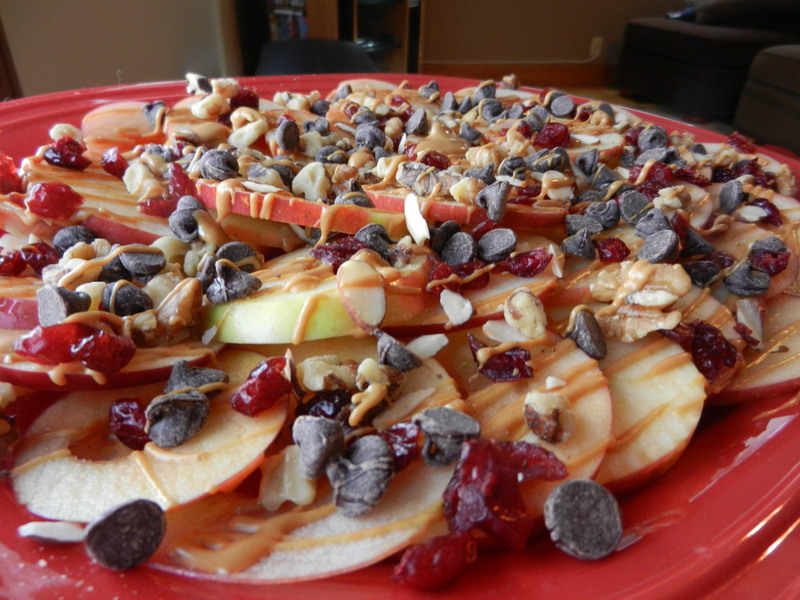 It included sliced apples, melted peanut butter drizzled over top, and was topped with almond slices, walnut pieces, Craisins, and chocolate chips. 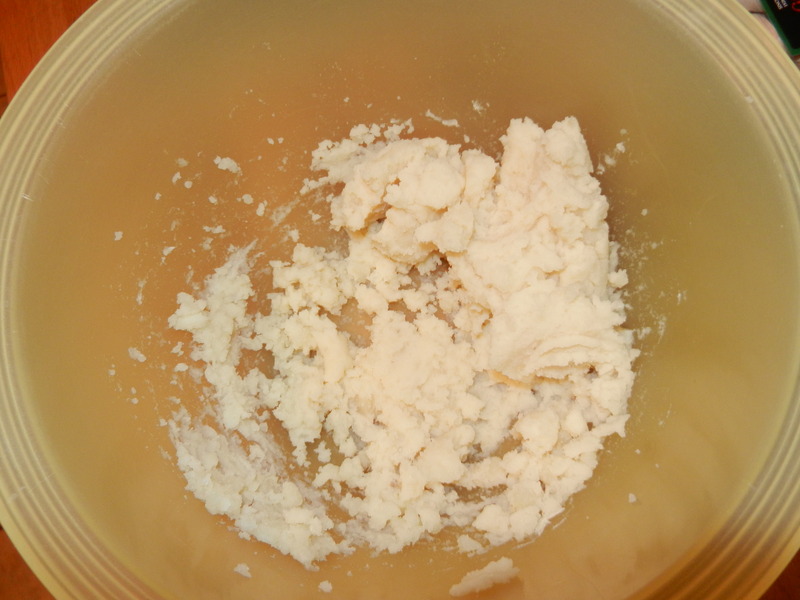 This was a huge hit and it was so simple to make! This would be a huge crowd pleaser with kids as well. At the meeting there was everything from beet salad, to pb and j sandwiches on pink bread, strawberries, red bell peppers, heart shaped egg salad sandwiches, pink and red M & M’s (which I had WAY too many of), pink cupcakes (also had one of those), meatballs, etc. We go all out at our work meetings. Lunch held me over very well. I had another meeting from 5:30-7 and didn’t get home until about 7:30. This was waiting for me at home upon my arrival. My favorite gummy treats, three amazing cards which were all so sweet (from Moose, Dana, and one from my mom too), and the gift in the pink bag was a bathrobe from Target that I have literally been eyeing up for the past year! 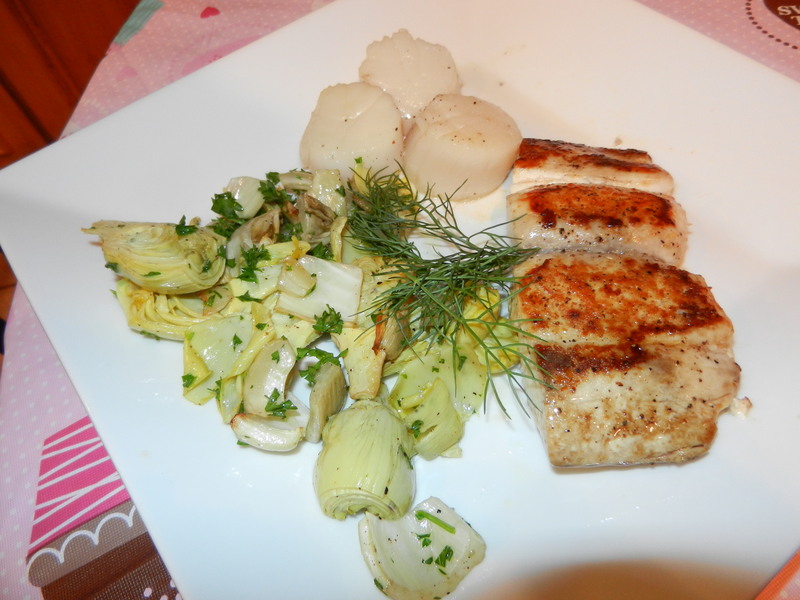 On the menu: Lightly pan-fried scallops and fresh Mahi-Mahi that Dana caught earlier today. 🙂 Ha ha, that would be great! Alongside were oven-roasted fennel and artichoke hearts. Everything was unbelievable. I even liked the fennel! It didn’t have much of a licorice taste like I was expecting, it took on a “roasted” flavor and I actually really enjoyed it. I couldn’t finish everything on my plate because I was filling up way too fast and I knew there was some really great dessert yet to come. 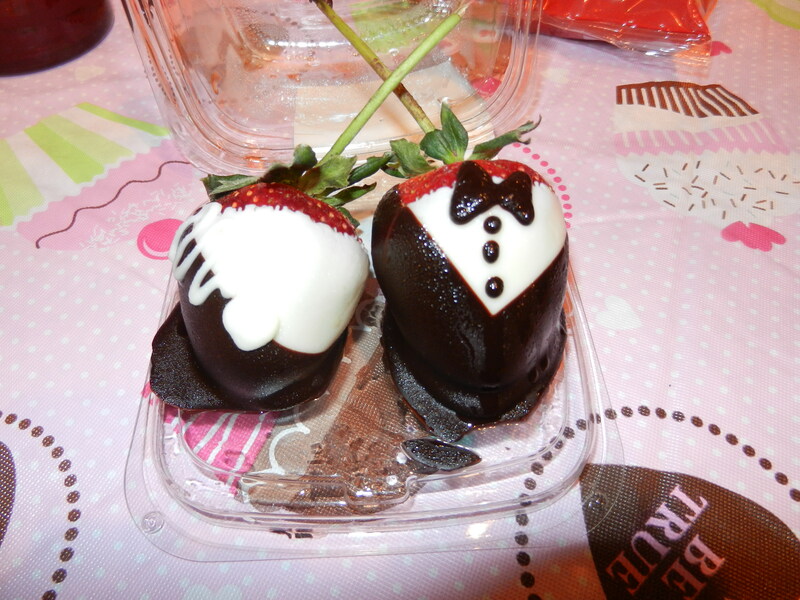 Dessert started with these adorable chocolate covered strawberries. Second course of dessert was cookie dough ice cream and warm, fresh brownies. 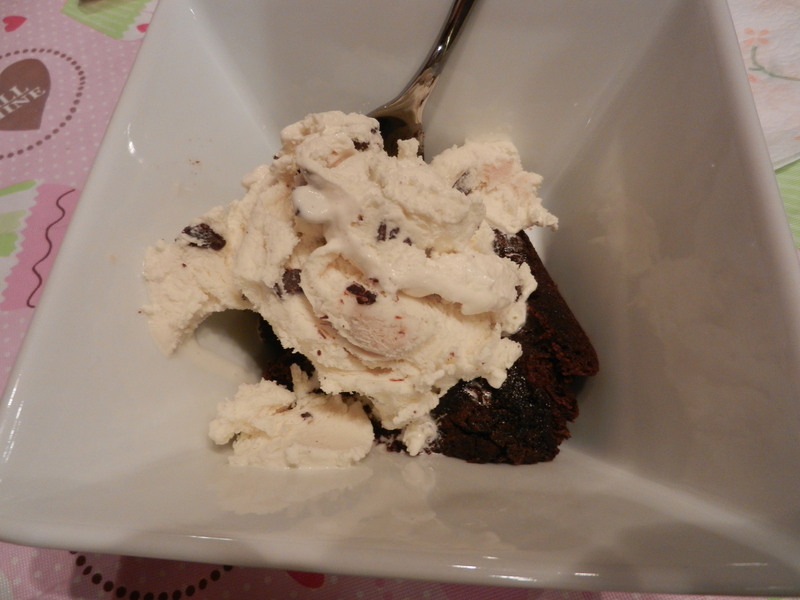 The combination of cold ice cream and warm brownies, and the way the ice cream melts into the brownie and creates a fudge like brownie….I can’t even believe how amazing it is. I don’t get this treat very often, but when I do, you better watch out, I will put myself into a brownie and ice cream coma. This picture does not describe the magnitude of my love for this dish. 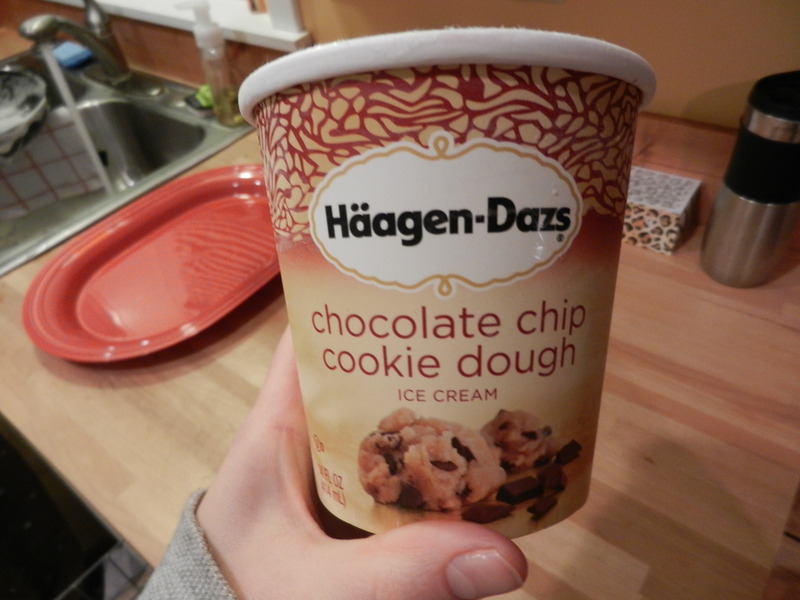 Once I finished this deliciousness, I felt like I had a boulder sitting in my stomach. I ate enough sugar today to last me through the whole month. After dinner, we watched a great Valentine’s episode of Glee, and before we knew it it was 9:30 which means time to get ready for bed! I promise I am only 26 years old. I really need my sleep though. 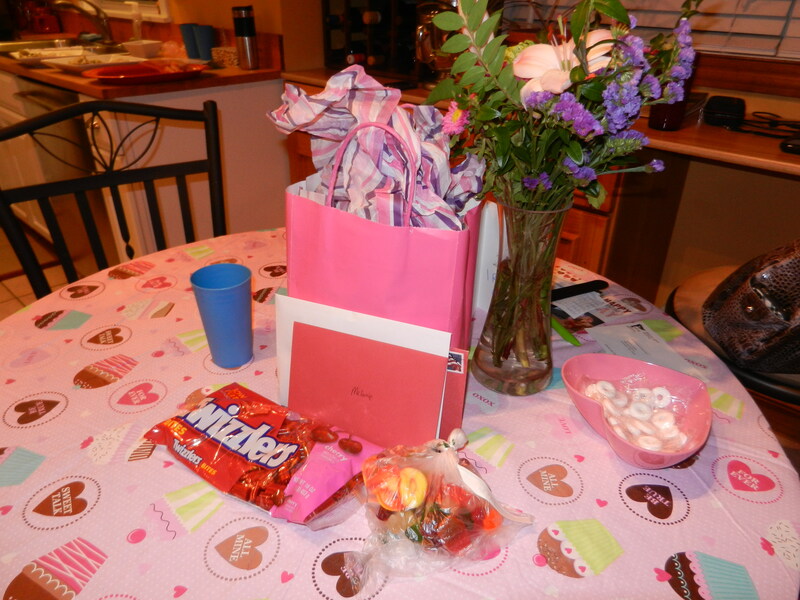 Dana really pulled off an amazing Valentine’s Day. I told him “he won” this year for sure. Not that I really mean it’s a competition but he just put so much time into it and made it so unbelievable. The couple hours that I did have with Dana made up for me having to work until 7 last night. Now, I have some major gummies to eat before lent begins next week! One last note. Valentine’s Day holds an extra special place in my heart, because I remember my Grandma K who passed away 8 years ago on this day. She was able to join her husband in heaven on this special day devoted to love. She was an amazing, caring, funny, spitfire of a woman who will always be remembered. I mentioned previously that I had exciting events planned for the upcoming year. It’s share time. Trip to California to visit friends–next week! A weeklong vacation to the Dominican Republic—end of April! We just booked this two nights ago! I’m probably forgetting a few things in there! In between those events are birthdays, baby showers, weddings, fun sun time, hopefully a garage sale….and more. It is going to be a great year! I am so pumped for it all! I’m off to get ready for work and maybe going to throw something in the crockpot? We will see. Have a great day! Happy Wednesday.